Nairobi — South Sudan President Salva Kiir says he will not interfere with the probe into the murder of Monica Kimani even after one of his Generals, Awet Akot was linked to the incident. Speaking on Jeff Koinange Live (JKL), Kiir stated that he will not stop detectives from questioning General Akot's alleged ties to Monica. "That General can be put to question. I will not stop him from going for investigations or going for any questioning, no. Even where you come from, there are many things happening, but I do not believe my brother President Uhuru is aware of. It is not each and everything that is brought to the attention of the President," he said. He however observed that those who may have been involved in her business might not necessarily be South Sudanese. "It is not me to investigate. 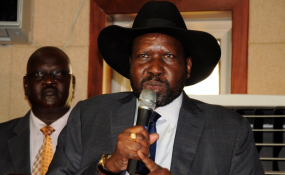 The people who are accused of having laundered money with her, yes, they may be in Juba but my brother, the problem is that it may not be a South Sudanese who is doing this," he said. "If you walk on the streets here, the nationalities that you will see on the road are not South Sudanese and they came here for business just from 2005 when the Comprehensive Peace Agreement was signed." He stated that there are business people of all nationalities in South Sudan and some of them might have been involved in Monica's business. "We found that when people are still pouring into South Sudan up to the northern part, they went to the most remote areas and these are business people who did not run away from the war. They are making a lot of money and how they do that I do not know. Your investigations in Kenya may find out how this young girl died," he said. During the show, Kiir expressed his sorrow at the loss of life and stated that the culprits must be dealt with. "I am very sorry for the loss of life of that young lady. It was my first time to hear that there was such a personality in South Sudan and that she managed to acquire a lot of money and on her way back to her own country, she got killed." "I never knew about her, I never heard of her presence and I do not know who the culprits are because she lost he life in her own country." Citizen TV journalist Jacque Maribe and her fiancé Joseph Irungu alias Jowie who are suspects in the case will know their bail fate next week after they pleaded afresh to the charge of murder jointly with others not before court. Royal Media Services insists Maribe is still an employee and has supported her release on bail. In documents filed by her lawyers, the Royal Media Services stated that she has taken leave to attend to personal issues.